We’ve seen many different rankings in the Magento world, and thanks to Ben Marks and one of his recent tweets, I took it upon myself to dig just a bit deeper around the number of Magento certified people (totals include developers and solution specialists) per capita. The initial conversation was about whether Netherlands or Croatia are leading these rankings globally, but as it turns out after I took a closer look at the official numbers, there are actually countries doing way better than us. Ok, but why use this metric in the first place? Well, it’s rather difficult to compare countries using absolute numbers and if we combine absolutes with something like this (number of Magento certified people per 1M of general population in each country) and then analyze the data, we can see some interesting trends and put things in a different perspective. For example, we can see how in some countries the efforts of several individuals and companies can really make a difference and impact their local communities – and this is exactly what the metrics in this case are showing or hinting at. It’s impossible to see people who have opted not to be visible in the directory, so the numbers are not 100% representative of the real situation with certifications. Another one is – there are people (app. 140 out of 5288 listed) who don’t have any country associated with them, so these have not made the numbers. And finally – smaller countries can improve their position more easily. But then again, there are only two countries with less than 1M people in Top 50 so that’s not that big of an issue. 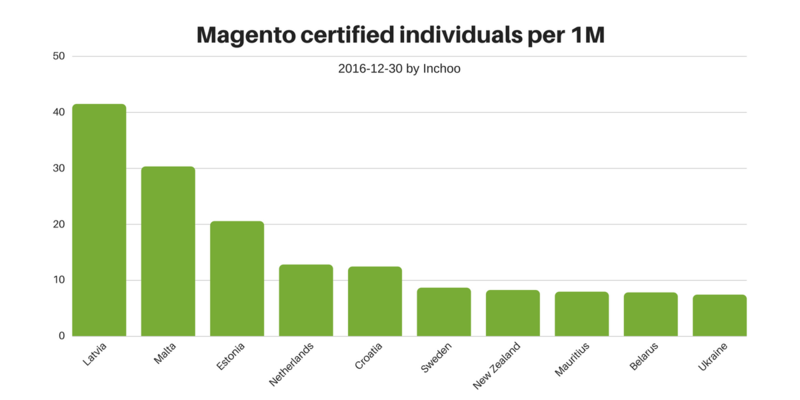 You can check out some of the hard data below, but for the sake of this post, I’ll focus more of the analysis on the thing I found most interesting – finding out just how many certified Magento people per 1M of the total population in each of the countries globally. While it may come as a surprise that Latvia is the one leading the pack, Scandiweb team have been doing an amazing job over there in the last years, getting a lot of their employees certified in the process, and building on the community in this Baltic country. We’ve also gotten quite fond of them as they sent the largest delegation to Developers Paradise 2016 in Opatija so we’re happy to see our Latvian friends in the significant lead with 41,4 Magento certified individuals per one million people. In not that close second, we’ll find Malta. Now, this one is the only really debatable country to make it into Top 5 as it doesn’t make sense to say they have 30,3 people per 1M if they have the total of 13 people certified (and the total population of less than 500k). They are also the only country besides Montenegro to have at least one person certified and the population of less than 1M, so they do deserve to get some credit in any case. 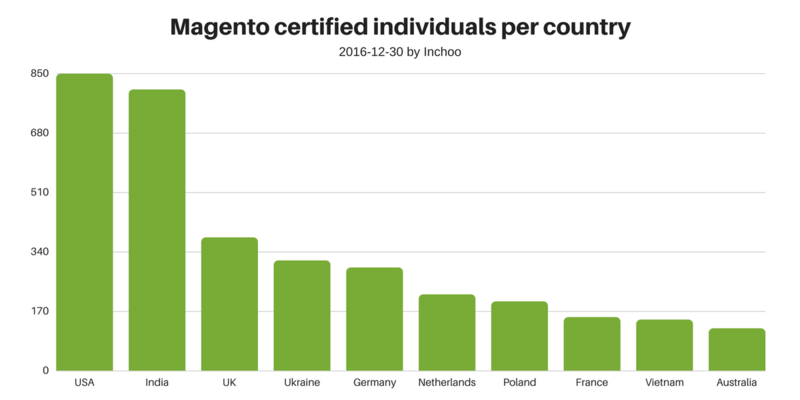 We can either take them out of the chart or change the metric to certified per 100k people (which we can do, or not), but after them there’s another Baltic country, a Latvian neighbour – Estonia – with 20,5 Magento certified people per 1M. Yes, it helps that these three countries topping the charts have 1-2 million people (or much less in case of Malta), but still – the smaller the country, the smaller the pool of people you can find those willing to dedicate their everyday work to a specific eCommerce software, so these numbers do hold value. And then we have Netherlands – and hats off to them and everyone around an amazing community they’ve created as they are only one of two countries with >10M people who made it into Top 10. Can you guess the second one? Well, it wasn’t that difficult to spot Ukraine, right? If you add to that one of the latest similar investigation by Willem de Groot (who many of you will know as the man behind MageReport) which shows that the Dutch are way ahead of everyone in number of Magento stores per 1M, it clearly demonstrates the strength and impact Magento and its community has had on the businesses in this country, and vice versa. The reason why I started this was, of course, a chance to do some humblebragging as well, since we invested a lot of efforts of our own into Magento and local community of developers, and Croatia is in fact right there, in Top 5, with just over 12 Magento certified people per 1M, chasing after our friends from Netherlands – let’s see how the tables will turn in 2017. It would be really nice to see how our city of Osijek would rank on a similar chart if we compared cities globally, but that one is much more difficult to get right (proper data, cities vs metropolitan areas etc.). For you who like to play around with numbers, here are some more charts to check out. Click on the thumbnails for full images. 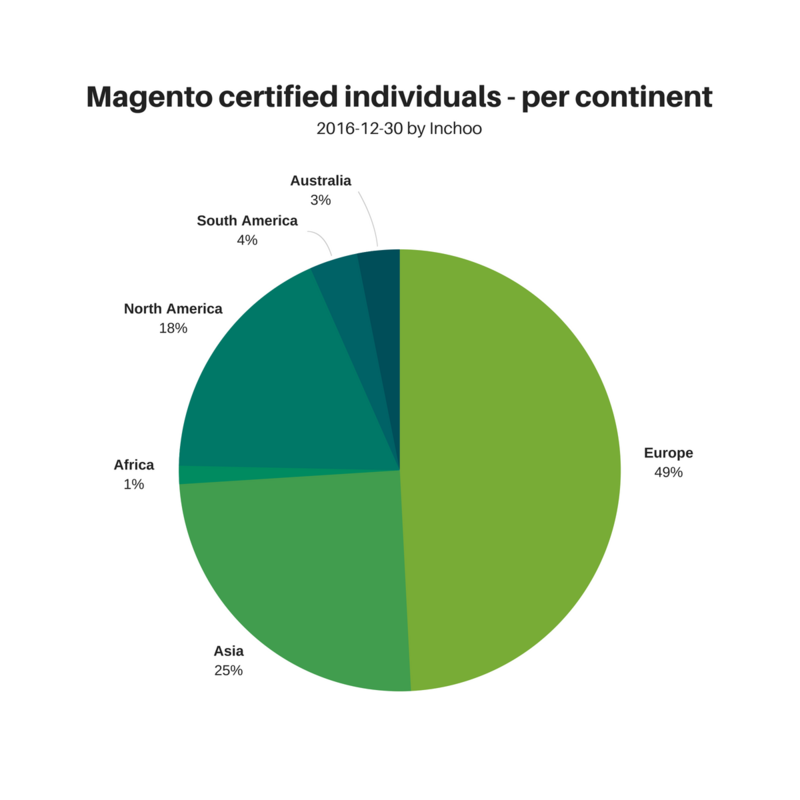 A) USA (849) holds a slim lead over India (804) in the total number of certified individuals, and these two together take over 30% share of the global total of all Magento certified people. B) European countries hold almost half of all certificates globally, while having just 10% of the global population. If you’re Magento certified yourself, jump on to the directory to check if you have a city/country listed next to your name to see if you made these numbers and helped your country out 🙂 If there’s something missing, there’s always the FAQ to help you sort it out. And let’s all keep an eye out on these numbers and use them to further improve on the co-opetition within Magento ecosystem. Hi Aron, great information about magento certified people. The way you explained magento certified individuals per capita is really wonderful. It’s very useful and grab my attention. What an amazingly written post… The in-depth research about hard data as well as Croatia is really impressive and worth reading! As a Latvian I am happy and proud for the success of Scandiweb and the signifficant number of Magento devs in Latvia. I am going to apply for Magento certification too, so soon the numbers will grow. Interesting reading! I for one am certified developer from Bulgaria. The last time I check there were 4 frontend and 3 Developer Plus. 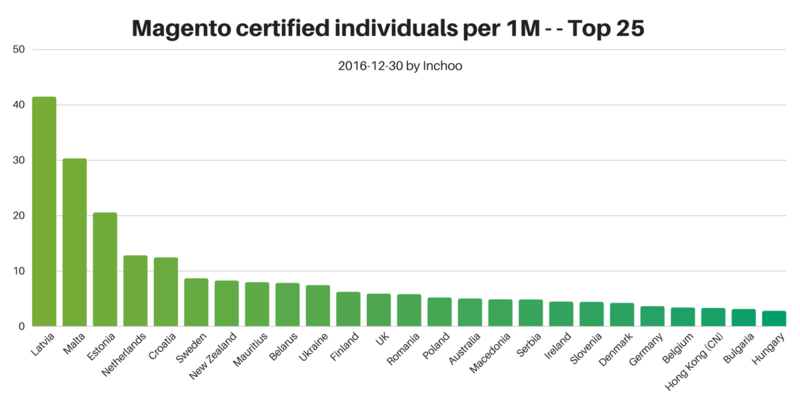 That makes 1 person per 1M 🙂 There are many more developers that work primarily with Magento but they are not certified. I personally think that the certification process made me learn a great more than I thought I know about Magento. Any idea on when M2 certification will start?